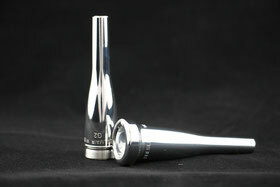 Since around 1990 we produce mouthpieces with a heavy body. In the opinion of many musicians the typical form of a heavy blank is just an eye catcher. Intensive research resulted in understanding the facts behind. Apparently trumpets with massive bodies need mouthpieces with adequate mass. When playing on a trumpet vibrations are generated which can be measured with appropriate technical equipment. These frequencies are realized by the the player itself and influences the objective soundimpression. Every musician has his "sound concept". He wants to hear and to feel "his" sound in a special manner. And will do a lot to realize "his" sound finally by several attempts. By using a heavyweight mouthpiece the frequencies occurring are different to that from a standard mouthpiece. As These frequencies are transmitted directly to our brain by "bone hearing" the Sound Impression is quite different to an auditor. The musician (trumpet player) hears objective, we, the audience hear subjective - we are not "connected" to mouthpiece and instrument and we do not feel that additional frequencies the player realizes (not hear - just feel). The total sound impression is affected by outer form and mass.